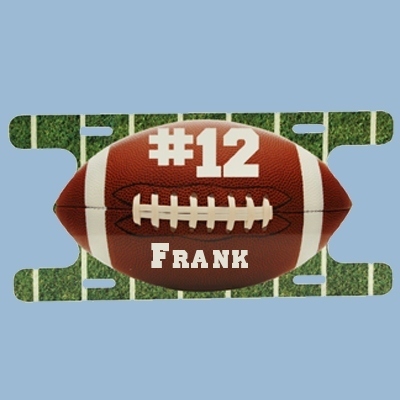 Custom Shaped License Plate for your football player or fan. Personalize the Custom Football Car Tag with any name, number, or custom text. These new and nifty shaped license plates are glossy white aluminum and measure 5.88" x 11.88". 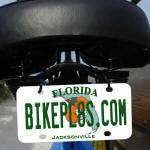 They fit most standard vehicles and a great for 1 plate states. Show your spirit for your football player or little league team. Fits most standard cars. 4 holes for application- printed full color. Personalize with any name, number, or custom text. 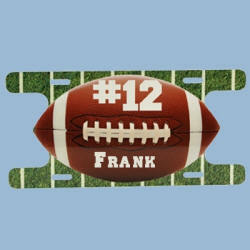 Personalized Football Shaped Car Tags with your desired Text, and our stock graphic. Made from Glossy White Aluminum. Fits most standard cars. Turn-Around Time: Normally ships in 3-5 days except during heavy volume holiday season. If you need your plate by a certain event date please be sure to let us know. Guarantee: Any item that is damaged in shipping can be exchanged for an identical item with the same personalization. However, a claim must be made with the freight carrier. We are not responsible for misspelled names, (unless it is our fault) incomplete information, or for wrong items purchased. Please check shopping cart carefully for accuracy before submitting as personalized products cannot be returned or refunded.